A powerhouse filly born to run by champion sire Written Tycoon from the stakes winning Flying Spur mare Das Machen which places her on an exceptional breeding cross. View her profile by clicking here. WRITTEN TYCOON (AUS) (Chestnut 2002-Stud 2007). 2 wins at 2, STC Todman Slipper Trial S., Gr.2. Leading Aust. Sire of 2YOs 2015-16. 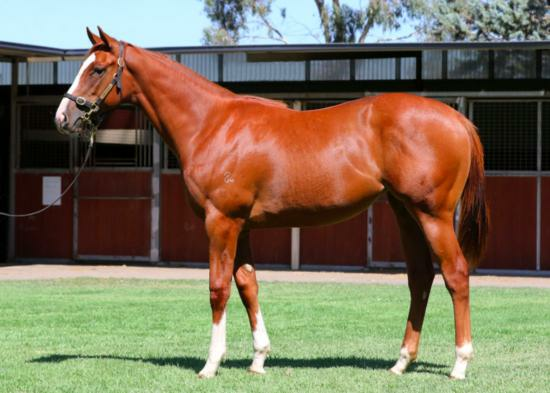 Sire of 498 rnrs, 368 wnrs, 23 SW, inc. Capitalist (ATC Golden Slipper S., Gr.1), (La) Luna Rossa, Tycoon Tara, Music Magnate, Written By, Howmuchdoyouloveme, Super Cash, Winning Rupert, Rich Enuff, Booker, Written Dash, Trump, Vibrant Rouge, Hot Dipped, It is Written, Balf's Choice, Grande Rosso, Grand Tycoon, etc. Dazzy's Day (f. by Domesday). 2 wins at 1100m, 1200m in 2016-17 in Aust. Barking Spider (g. by Wanted). Winner at 1200m in 2017-18 in Aust. DAS MACHEN (Flying Spur). 7 wins. See above. Test Edition. 6 wins from 1200m to 1600m, A$188,453, AJC Best Bets H., Fringe Bar H., Maroubra H., Starcraft H., STC Club Managers' Association Australia H., VRC Better Loosen Up H., 2d Hawkesbury RC Blakes Marine H., STC Pink Day This Saturday H., 3d MRC Soho Square H., STC Kraft Foods H.
Stryke of Delight. Winner at 1100m in 2017-18, Ipswich TC Ray White H., 2d Ipswich TC Sky Racing H.
Flying Storm. Winner at 1600m, 2d CJC Trevinos Bar & Restaurant H., 3d CJC Race Images H., Skelton Brothers H.
Budget Bender. 7 wins from 1300m to 1800m, A$142,310, to 2017-18, BRC Brc.com.au H., 2d Ipswich TC Optus Business Direct H., 3d BRC Mount Franklin H.
Lucky Elixir. 4 wins from 1300m to 2400m, A$109,920, to 2017-18 in Aust. Lili Marlene. 4 wins. See above. News of the World. Winner at 1200m, 3d AJC Jack Gannon H., STC ABN Amro H., Canterbury Earlwood Probus 2YO H. Producer. Club Lady. 7 wins to 1200m, 3d STC Very Merry 2YO H. Producer. Lady Apryl. 5 wins from 1000m to 1800m in Aust. Kalalusk. 3 wins at 1400m, 1550m in Aust. Asmustard. 2 wins at 1200m, 1300m in Aust. El Univeso. 3 wins-1 at 2-at 1100m, 1600m, TTC Tyrepower H., 3d TTC Vamos H., Routley's H.
Cuvier Bay. 2 wins at 1100m, 1200m, TTC Weeding Party Hire H., 2d TTC Country Club Casino H.
FULL PASS (Dauberval). 2 wins at 2, WATC Crystal Slipper S., L, NJ Way S., L, 3d WATC Better Health H., 4th WATC Perth S., L. Producer. Kalkarni. 2 wins-1 at 2-at 1200m, WATC Tumeric H., Covertly 2YO H. Producer. Bold Tyrant. 35 wins-5 at 2-from 1000m to 1800m, A$135,380, STC Ashbury H.
Universal Lady. 3 wins. See above. COMMANDANT (Nelcius). 10 wins, Ascot Heinz Chase, L.
Firesilk (Firestreak). 10 wins-1 at 2-from 5f to 2m, Doncaster Easter H., Penultimate Apprentice H., 2d Newbury Greenham Group H. Hurdle, L, Ascot Young Entry Apprentice H.